Its October and it’s that time of year! The leafs are falling, the colors are changing, and the holidays are upon us. 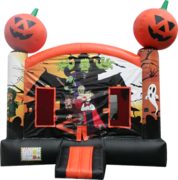 Crazy Monkey Inc. is getting all the best holiday rentals prepared, including our Halloween inflatable rentals. This is the time of year for parties, festivals, carnivals, and events! Are you a school planning a Halloween Party? Then you have come to the right place! Kids love our Halloween Bouncer! The giant pumpkins bouncing on the top get every into the holiday spirit. This bouncer has great ghoulish graphics on the front but it’s still fun for even the smallest of bouncers. This rental won’t last long, get it today! Another great Halloween Inflatable Rental is our Justice League Combo! Boys love to dress up like their favorite super hero and they would have a blast in this fearless hero bouncer. Click here to reserve this rental today. Dunk Tanks are a classic carnival item and we have one of the best dunk tanks in Erie, Pa! Ours isn’t just your average dunker, it has a special window on the front so you get the full show. Click here to rent it today! Don’t forget the delicious food. Check out our concession rentals! Crazy Monkey Inc. is your one stop shop for party rentals this holiday season! Click here to contact us today!